Background: The interest in oral candidosis has waxed and waned from the period of Hippocrates. The acquired immune deficiency syndrome (AIDS) epidemic has certainly bolstered these figures on oral candidosis, with diabetes and oral cancer being no exception. A need for rapid detection of Candida is made possible by the use of Calcofluor - White (CFW) stain when examined under a fluorescence microscope. The present study was aimed at assessing the efficacy of CFW is compared to Gram stain and periodic acid Schiff (PAS) in detection of Candida in oral precancer and cancer. Materials and Methods: The study group consisted of patients with precancer (n=45), cancer (n=45), and control group (n=45). 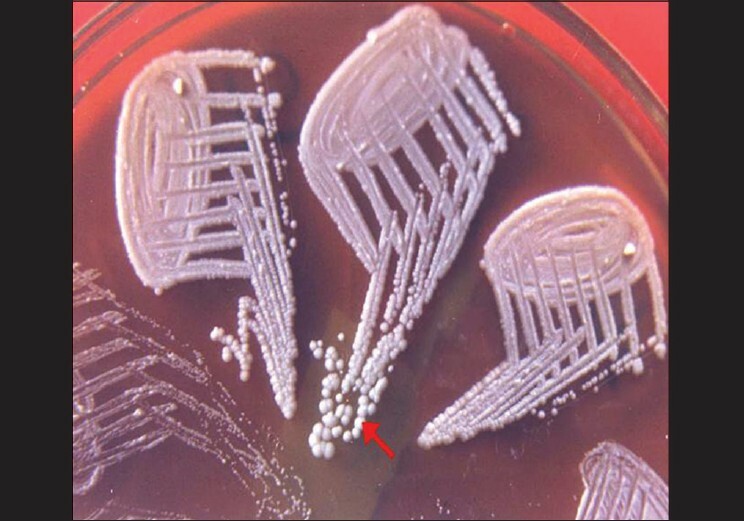 Presence of Candida was confirmed by culture inoculation along with a germ tube and carbohydrate fermentation test. 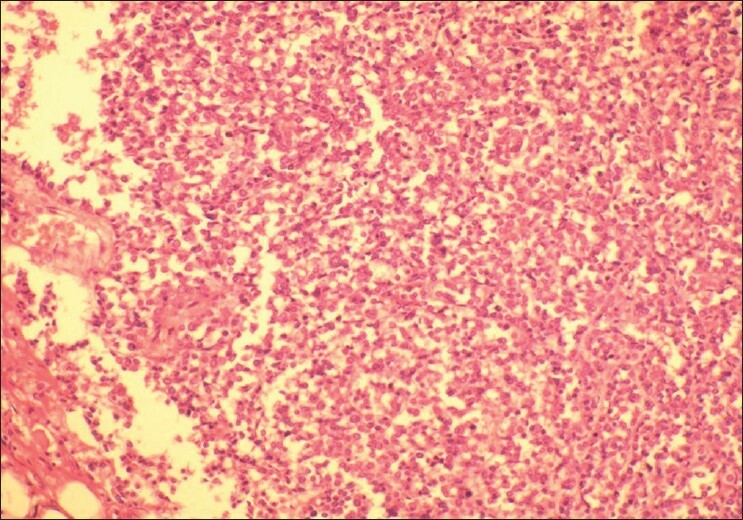 The cytopathological smears were analyzed by papanicolaou - CFW and Gram staining, whereas, tissue sections were stained by PAS and CFW staining. Results: Candida albicans was the predominant species identified. A highly significant association of Candida was seen more often in cancer than in precancer. Both in cytology and histopathology Candida detection by CFW was higher. In precancer it was 48.88% in smears and 40% in tissue sections, whereas, in cancer 60% in smears and 55.55% in histopathology. Conclusion: Among the various diagnostic tools used in the present study, the use of CFW is seen to be a simple, effective, rapid, and reliable method, both in cytopathology and histopathology. 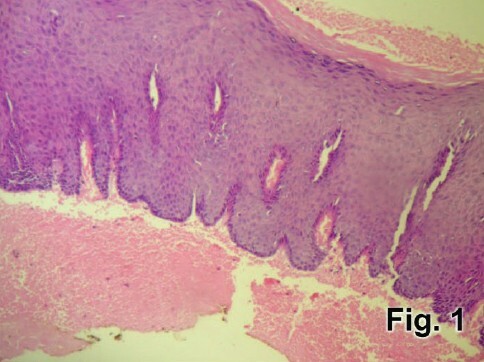 Calcifying epithelial odontogenic tumor (CEOT), also known as Pindborg tumor, is a rare benign odontogenic tumor of locally aggressive behavior. It is more common in the posterior part of the mandible of adults, typically in the fourth to fifth decades. Its origin as well as its true malignant potential is not clearly known. It usually starts as a painless swelling and is often concurrent with an impacted tooth. A case of CEOT in a 55-year-old man with multiple myeloma is presented. Clinical, radiological, and pathologic findings are discussed. 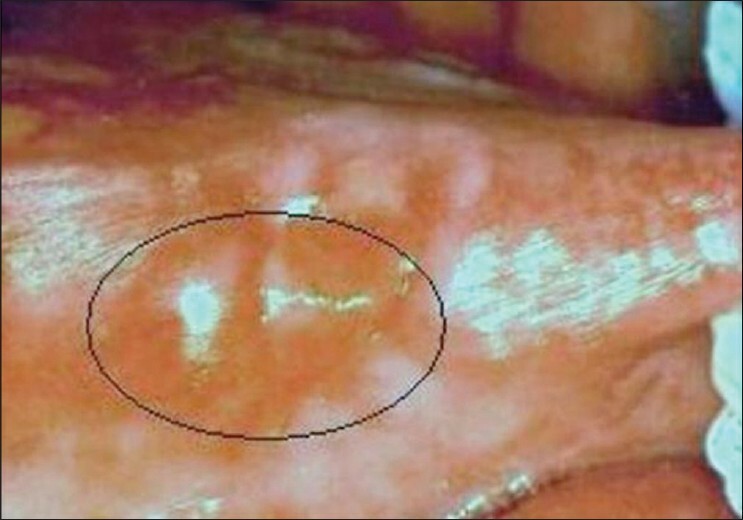 Mucormycosis is a rare opportunistic infection caused by fungus belonging to the order Mucorales. A case of a controlled diabetic male with rhino maxillary mucormycosis, with cerebral extension, is described. 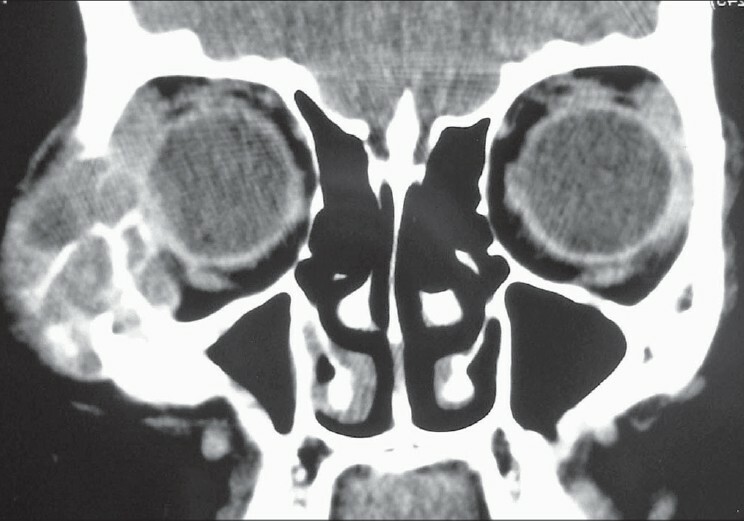 The patient presented with hemifacial swelling, a nasal twang in his voice, fever, ocular signs, gross tissue destruction, and was sluggish. Early recognition of mucormycosis is necessary to limit the spread of infection, which can lead to high morbidity and mortality. Therefore, health practitioners should be familiar with the signs and symptoms of the disease. Ewing's sarcoma is a malignant, small, round cell neoplasm that normally affects the long bones of the limbs or the pelvis. It is a relatively frequent malignant bone tumor in children. The occurrence of the primary tumor in the facial region is approximately 2%, with most of the cases affecting the mandible. 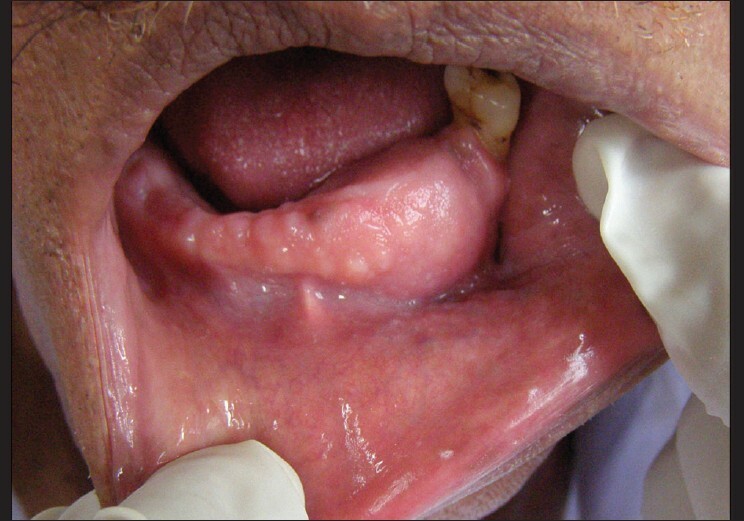 Primary zygoma involvement is rare and as per the available literature only three cases have been reported. 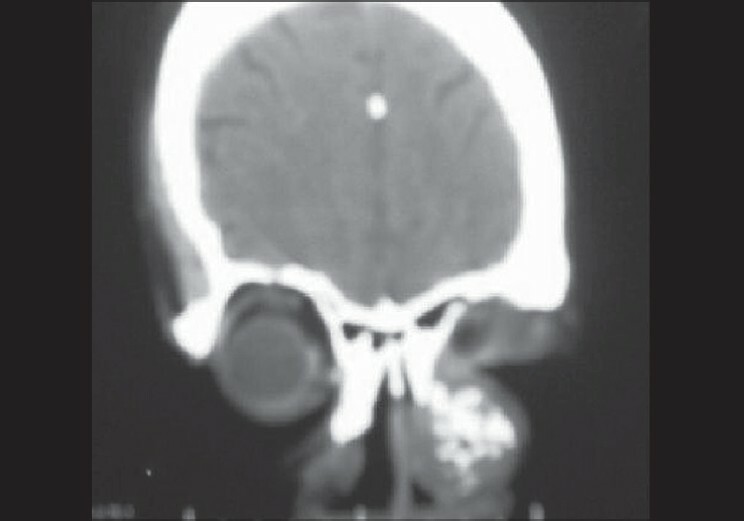 A case of Ewing's sarcoma that originated in the zygoma of a 15-year-old girl in reported. Bearing in mind its neuroectodermal origin, immunohistochemical studies are essential to distinguish Ewing's sarcoma from other small round cell tumors. Intraoral schwannomas are uncommon and intraosseous ones are even rarer. 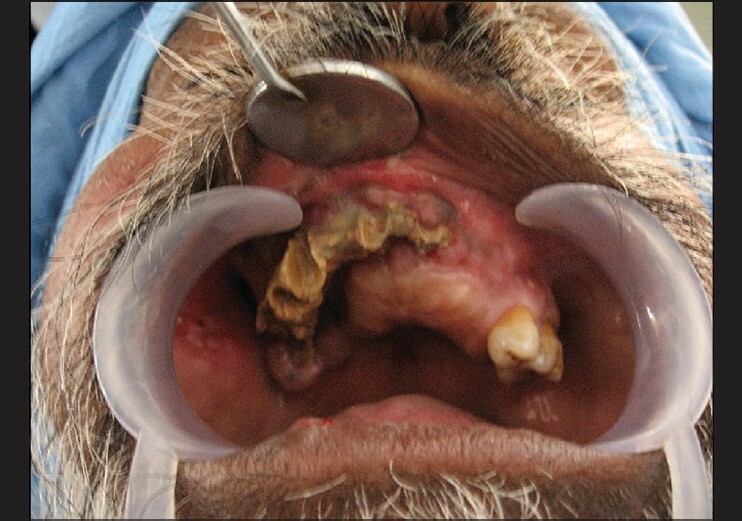 The intrabony lesions account for less than 1% of the central neoplasms.According to the literature, there have been reports of 44 cases of intrabony neurilemmomas that occurred in either of the jaws. In theis case report. we report a case of central schwannoma of the mandible in a 23-year-old female, who presented with a swelling involving the right body of the mandible. Radiographs revealed a well defined, unilocular radiolucency with bicortical expansion. Histopathology and immunohistochemistry confirmed the diagnosis of schwannoma arising from right inferior alveolar nerve. The lesion was treated by segmental resection and reconstructed with autogenous iliac bone graft. The calcifying odontogenic cyst was first reported by Gorlin et al . in 1962. It had been classified as a neoplasm related to the odontogenic apparatus because of its histological complexity and morphological diversity until it was renamed as a calcifying cystic odontogenic tumor by the WHO, in 2005. 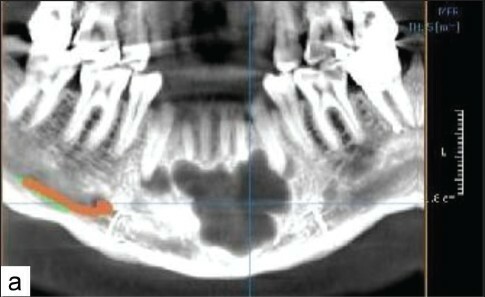 Here we describe a case of mandibular calcifying cystic odontogenic tumor in a 75-year-old male, which was present since five years, with a history of occurrence after the extraction of teeth in the involved region. The lesion was surgically removed and a histopathological examination revealed a cystic tumor with predominance of ghost cells and some amount of dentinoid tissue. A cyst following implantation of respiratory epithelium during surgical procedures has been documented only rarely. 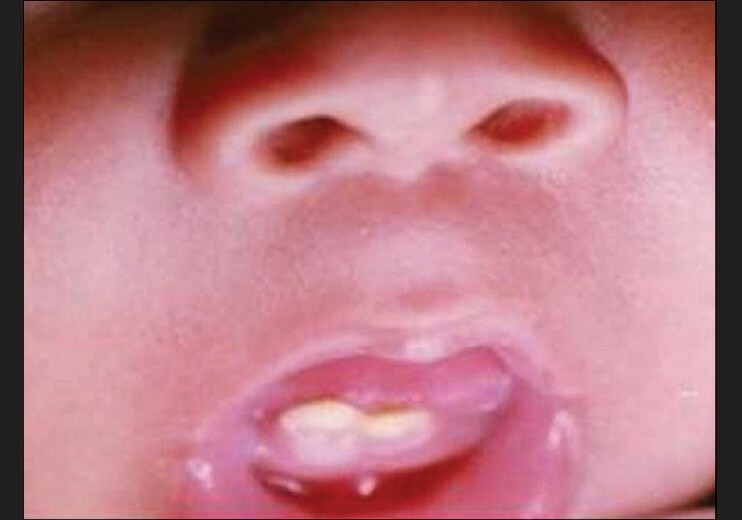 A variety of names have been attached to this lesion: respiratory mucocele, respiratory implantation cyst, surgical ciliated cyst, and surgical (implantation) cyst. In seven prior case reports, the interval between the initiating surgical procedure and diagnostic biopsy of the resultant well-circumscribed radiolucency and histopathological demonstration of distinctive pseudostratified ciliated columnar epithelial lining has varied from 4 to 40 years. 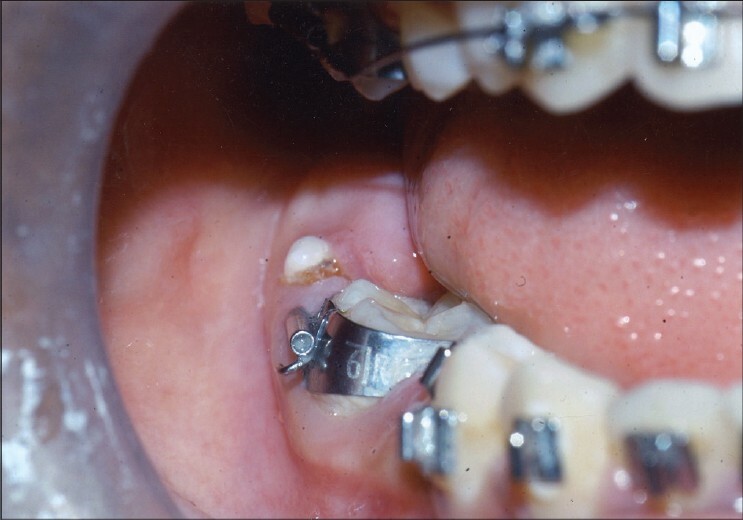 In the case reported here, chin augmentation used "residual maxillary bone" as the donor tissue and likely transplanted sinonasal mucosa into the mandible during orthognathic surgery, resulting in a painful anterior mandibular cyst lined by respiratory epithelium that was ablated 16 years later. Necrotizing sialometaplasia, is a benign inflammatory lesion primarily involving the minor salivary glands of the hard palate. 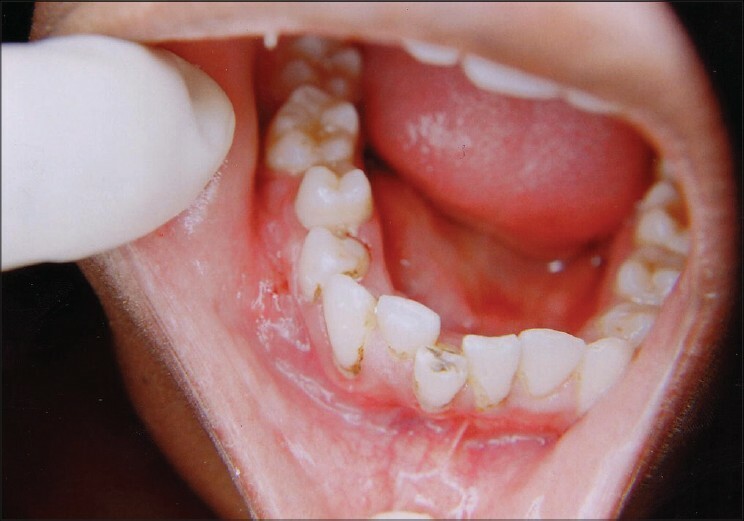 The lesion often presents itself as a deep-seated palatal ulcer with clinical and histological features similar to those of a malignant neoplasm. Here we report a case of necrotizing sialometaplasia in a 40-year-old female, present on the lateral border of the tongue, mimicking squamous cell carcinoma, clinically. 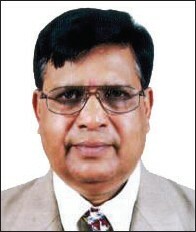 A correct diagnosis to avoid mutilant surgical treatments is essential, considering that it is a self-limiting disease. Oral metastasis of breast cancer is less common than metastasis to other sites like the lung and liver. Breast cancer can metastasize to the oral cavity, with presentation like a benign oral lesion. We present an interesting case of breast cancer involving the gingiva with sparing of the underlying bone. The presence of teeth at birth or within a month post-delivery is a rare condition. A newborn, a 2 days old female, with two mandibular incisor natal teeth was examined. The teeth were mobile and were extracted because of the fear of aspiration and refusal to feed. The purpose of this report is to review the literature related to natal teeth epidemiology and discuss their possible etiology and treatment. Odontomas are considered to be hamartomas rather than a true neoplasm. They consist chiefly of enamel and dentin, with variable amount of pulp and cementum when fully developed. They are generally asymptomatic and are included under the benign calcified odontogenic tumors. They are usually discovered on routine radiographic examination. Eruption of an odontoma in the oral cavity is rare. Peripheral compound odontomas arise extraosseously and have a tendency to exfoliate. 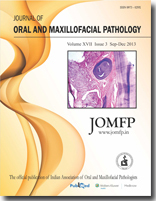 In this article we are reporting a case of a 15-year-old girl with peripheral compound odontoma, with a single rudimentary tooth-like structure in the mandibular right second molar region, which is about to be exfoliated. Its eruption in the oral cavity and location in the mandibular posterior region is associated with aplasia of the mandibular right second molar, making it an interesting case for reporting.